Finally, it's Lunar New Year! How's everyone's CNY celebrations so far? Mine has been a #cheatdayeverday since CNY eve till date, so I'll probably have ALOT catching up to do after my CNY break is over (starting tomorrow). Other than stuffing myself silly with the usual CNY goodies like fried hae bee hiam (especially so this year, somehow), pineapple tarts and kueh bangkit, there's always one particular CNY goodies that I absolutely MUST eat every year. 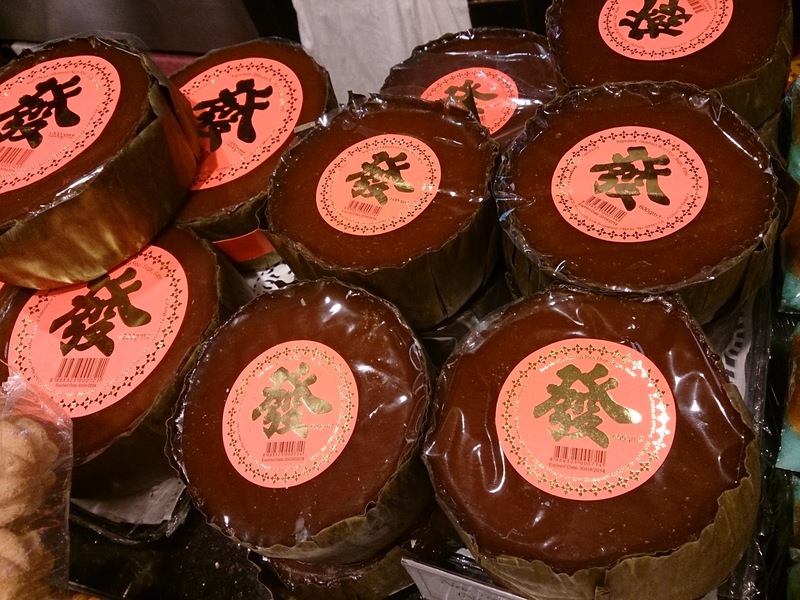 Nian Gao (directly translated as Year's Cake) is actually a sweeten rice cake the Chinese usually eats during our Lunar New Year. It's either eaten freshly steamed, or sliced and deep fried in normal flour batter or sandwiched between thinly sliced yam or sweet potato, battered and then deep fried. Loads of refined sugar, carbs, and fats! What a glorious yummy snack! Yes, #fatedieme I know. Don't rub it in. 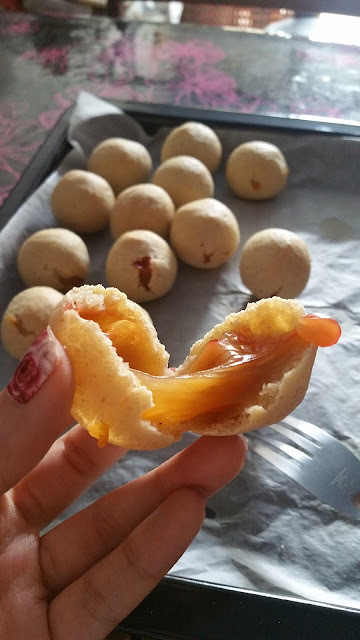 This year, I've decided to at least cut down on some of the fats and bake my nian gao instead, by marrying it with another of my favourite snack, MOCHI! First, let's start by cutting the nian gao into roughly 1.5cm small cubes. Make sure you've refrigerated them so that they're harden up. They're a horror to slice if they're all fresh and soft. Making the mochi dough is super easy, just dump ALL the ingredients into a big bowl and mix until it comes together into a soft dough. It should be soft, yet not liquidy, slightly sticky on your hands but still pliable. 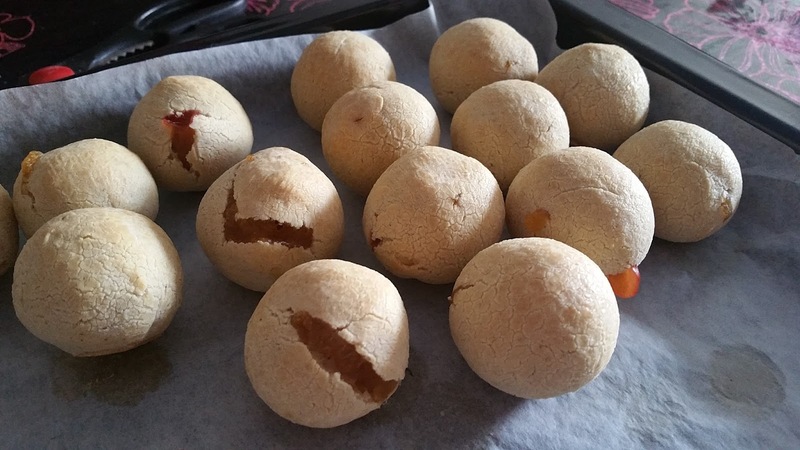 Divide the mochi dough into small balls of roughly 15 to 16g each and wrap a nian gao cube into each mochi dough to form small ping pong sized mochi-nian gao balls. Make sure there's no obvious exposure of the nian gao or else you'll just end up with nian gao-volcano mochi balls in the end. The mochi balls will not spread (at all) during baking, so feel free to space them closer together on your baking sheet. For crispier surface, brush the mochi balls with some water before sending them into the oven to bake at 180 degree Celsius for about 25 minutes, or until you see (some of) your mochi balls cracking open and lava nian gao bubbling through. Be sure to let it cool slightly before biting into one because it'll burn your tongue. But try not to wait until they turn completely cold as well, for the lava nian gao inside would have harden back up. As the mochi shell is not sweeten at all, the sweetness of this snack totally depends on how sweet your nian gao is. 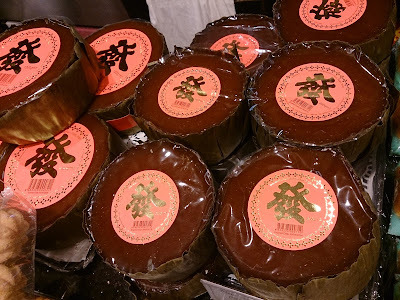 And since the nian gao is store-bought, it also means you can't control how sweet this will get, unless you make your own nian gao as well. But who cares if it ends too sweet or not sweet enough? The texture of the crispy outer shell of the mochi paired up with the gooey chewy molten nian gao is more than enough to worth all the hassle of baking this cute little CNY treats! I got really hungry after reading that and I am on a diet. It looks really yummy but a little hard to make so I'm gonna have to find where I can buy myself one of those. Awesome work. Surely my husband would love this kind of treat as he enjoys cinnamon a lot. I hope this is one easy quest as I plan to bake one. Good luck to me. But I salute your tenacity to bake as baking can be real fun but a lot of precision is needed. this looks so delicious, sharing it with my partner to cook some for me, or perhaps I should try my hands. Thanks for sharing. Wow, these look so delicious! My sister should try baking these on the next Chinese New Year. But I guess I'd be using milk powder instead. I'm actually not a fan of cinnamon.. Hehe. Thank you for this! I'm already salivating as a result of what I see. I will try my hands on this to see what I come up with. Thanks for sharing. I think we eat nian gao here too whereby we call it tikoy for Chinese New Year. For our version, we dip it in battered egg then fry it. Anyway, the mochi balls you made look fantastic. I'd definitely try making it if we had an oven.